Prime Minister, Narendra Modi launched various development projects worth Rs.1000 crores in Daman & Diu today. He distributed certificates to beneficiaries of programs and addressed a public meeting at the Daman college ground.The Prime Minister described the public meeting in Daman as a historic event not only in terms of the number of people who have joined him but also in terms of the development projects being launched from there.PM urged the people of Daman to continue giving topmost importance to cleanliness as the opportunities in tourism increase when there is cleanliness. He congratulated the people and local administration for making Daman Open Defecation Free. He said that the manner in which Daman has taken to cleanliness as a mass movement using e-rickshaws and CNG is a shining example for all of us.Lauding the inclusive culture of Daman, PM said that Daman has become a mini-India and people from all over the country live and work here. The Prime Minister said that the Government is taking several steps for the welfare of fishermen and his entire emphasis is on the 'blue revolution' inspired by the commitment to bring a positive difference in the lives of fishermen.The Prime Minister inaugurated Air Odisha's flight connecting Ahmedabad with Diu under the UDAN scheme. 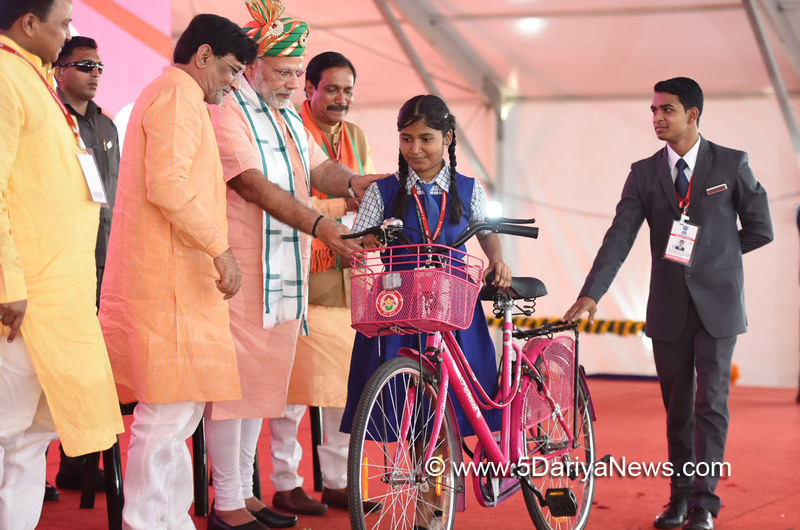 He flagged off Pawan Hans helicopter services from Daman to Diu through a video link.The Prime Minister presented Badhai kit to the newly born girl child under Beti Bachao, Beti Padhao yojana. He handed over certificates to women given free driving training by Daman and Diu administration and cycle to school going girls. The Prime Minister distributed permits for CNG driven vehicles. He distributed certificates to the beneficiaries of Pradhan Mantri Aawas yojana Grameen and Urban, Pradhan Mantri Jeevan Jyoti Bima Yojana, Pradhan Mantri Jeevan Suraksha Yojana and Pradhan Mantri MUDRA Yojana. The Prime Minister flagged off E-Rikshaw, Pehli Savari and Ambulances.